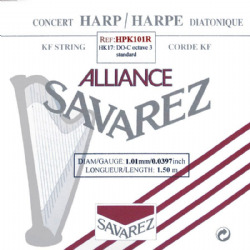 Savarez Alliance KF Carbon Harp Strings. This 'Medium Norris Gauge' is part way between Lever Harp and Pedal Harp tension. Suitable to try on any harp originally designed for Pedal Harp string tension. Prices for Full Sets of 24 (1A to 24F) or 26 (1A to 26D) strings include a 10% discount.